Wood plastic composite decking is a kind of decoration decking is popular in recent years. At the time of installation in order to ensure the smooth and beautiful, there are many problems need attention. 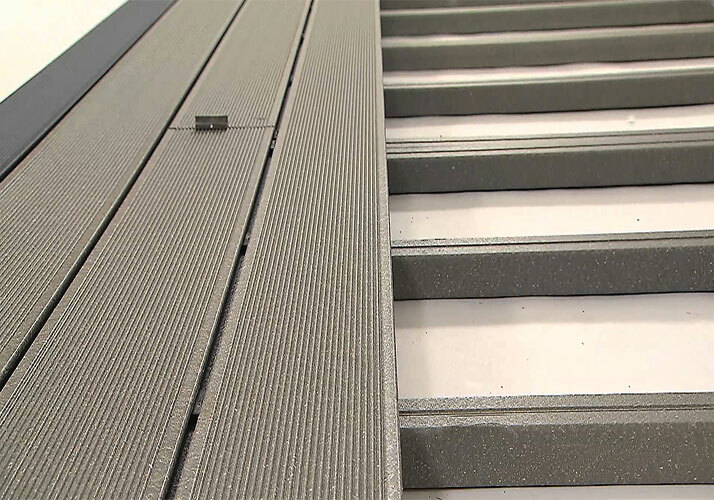 When installing the wood plastic composite decking, there are 5 steps, the first step is to clean the ground, the second step is the specific location of the decking plan, the third step is the installation process, the fourth step is cover decking, the last step is to do a good job of cleaning the decking surface. When installing the wood plastic composite decking, the first step is to calculate the specific installation area, so as to reasonable procurement of wood plastic composite decking materials. After the area calculated, the material purchased, then the need to install the ground line, note that line is a very important, will affect the future the effect of installation. Put the line even after the fixed keel position, the position error of the keel should be guaranteed in a millimeter and the keel line after the completion of entering into the next process. And then began the specific installation, the first decking should be fixed by self tapping screws, and then the position is smooth with level measurement, after the first decking after finishing followed by a subsequent installation of wood plastic composite decking, each decking should set aside about one mm around joints. Until the installation to the last place for the last piece of self tapping screws fixed on the bottom decking. After the installation of the surface of the sludge and debris clean up. the whole surface of wood plastic composite decking installed, also need to do pointing joint treatment can be chosen. The left telescopic pointing pulp professional, can also own blending slurry. After pointing cleaning the floor surface debris after cleaning, check pointing is smooth, not smooth for you once again pointing, then wipe off more than the latter.